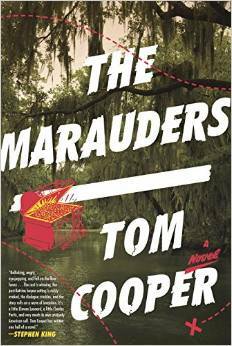 Tom Cooper‘s novel, The Marauders, was released from Random House-Crown on February 3rd. The book was a long time in the making, and has so far received very strong reviews. Megan Giddings’s story, “Good-bye Piano,” up at matchbook. Christopher Allen’s story, “Other Household Toxins,” up at Night Train. Gay Degani’s story, “Last Four Songs” up at Pure Slush. The SmokeLong Quarterly blog is launching a new feature listing newly published works, achievements, and awards by our contributors and staff and asking them (you) to submit to us. Entries should be recent, info regarding such should be no longer than 100 words including title of new work (flash, short story, essay, poem, memoir,or novel) and name of publisher (ezine, print zine, publishing house) plus link to said work and/or how to purchase). Please also include all links to your published work at SmokeLong Quarterly. This entry was posted in News Digest and tagged Beast, Bluegills, Christopher Allen, Gay Degani, Ghost Bike, Ghost Box Evolution in Cadillac Michigan, Language Barrier, Last Four Songs, Meg Tuite, Mutable Pleasures, Next Rest Stop Twenty-Two Miles., Night Train, Other Household Toxins, Pure Slush, Rose Metal Publishing Short Short Chapbook Contest, Rosie Forrest, Scapegoat, The Marauders, Tom Cooper. Bookmark the permalink.